The Dibb report appeared on June 29, on the eve of last week’s Australian parliamentary election, when voters repudiated incumbent prime minister Malcolm Turnbull. He had called the snap poll, confident of expanding his majority in the two houses of parliament. He has now suffered a 3% negative swing by the voters; the loss of at least 23 seats; and months of political uncertainty ahead, including the possibility his party will replace him as leader. The institute’s financial reports reveal it is financed by grants from the Australian Department of Defence, the Australian Army, the Australian Federal Police, the Dutch Foreign Ministry, and the Japanese Government; plus Raytheon, Northrup Grumman, Lockheed Martin, and Boeing — the leading arms-exporting corporations of the US. European arms builders also funding ASPI include the European missile-maker MBDA, BAE Systems, ThyssenKrupp Marine Systems, Rheinmetall, Airbus, and Navantia, the Spanish state shipbuilder. When Australians march into the field against the Russians, these suppliers aim to provide the best kit Australian money can buy. Australian historians and military analysts say the idea that Australia is a military protectorate, for which it must pay with troops for its protector’s wars thousands of kilometres from Australian territory, is almost as old as the colonial settlement itself, once British troops were confident the convict settlers would not rebel. 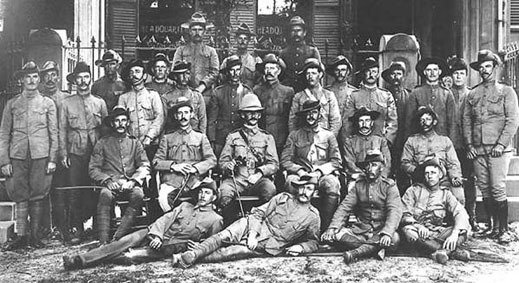 On British order, Australian troops were committed to the Sudan war in 1885; the Boxer rebellion in China in 1900; the Boer War in South Africa between 1899 and 1902; the war against Germany and Turkey in 1914, the war against Germany and Japan from 1940; and the war against the Malayan insurgency in 1948. The only time Australians prepared to fight against Russians directly was also on command from London; that was in the Crimean War of 1854, when units of cavalry, infantry and artillery were mustered in Sydney. This also means that war plans are decided and put into action in secret. 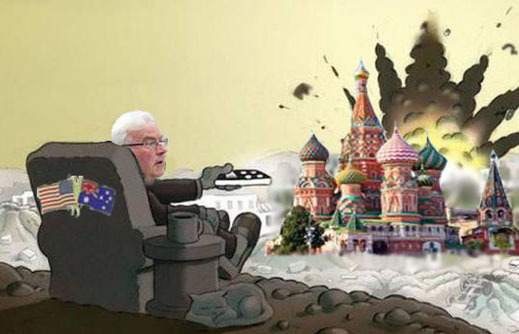 The plan for an Australian force of up to 3,000 troops to fight in Ukraine in 2014 was revealed by James Brown in a report issued three weeks ago. Brown is a former Australian Army captain and head of research at the US Studies Centre of the University of Sydney. 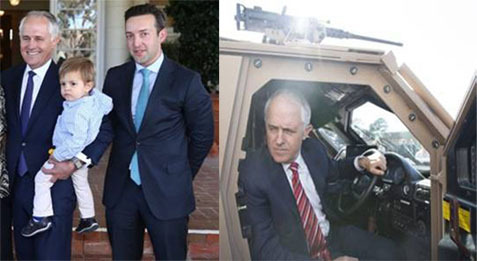 Brown (below, left) is also the son-in-law of Prime Minister Turnbull (right). If not from his father-in-law – in 2014 Turnbull was a cabinet member and prime minister in waiting — how did Brown know? Brown refuses to clarify his sources. His report also conceals the involvement of Dutch, NATO, and US commanders in the Ukraine war plan. Was it possible for two prime ministers, the Australian and the Dutch, to start mobilizing for a combined operation on the Russian border without US and NATO participation in the planning? Brown will not say. He does claim that then-Prime Minister Abbott had been foolhardy in considering such a largescale force in broad daylight on an open battlefield at the Russian frontier. He prefers, he reported, Australian special forces operating with the Americans, in the dark. For the Brown story, read this. To answer his question, Why Russia is a threat to the international order, Dibb cites 53 references and 11 footnotes. Take out 3 references by Dibb to speeches of President Putin, one to the published Russian military doctrine of 2014, there are just 6 other references which qualify as Russian sources of evidence. None of them is direct, military or official. They are the commentaries of think-tank academic Sergei Karaganov, former Russian foreign minister Igor Ivanov, and a group of analysts from the Valdai Discussion Club. As evidence of Russian intention, plan and strategy, just 20% of Dibb’s sources are Russian. The rest are UK and US sources, the most frequently cited of which is the Chatham House think-tank in London. The only serving military officer cited by Dibb is Philip Breedlove (right), a US Air Force general and the outgoing commander of NATO forces in Europe. Dibb footnotes himself more often for evidence of Russian threats than he cites Russian evidence. The “why” in the Dibb report title turns out to be rhetorical, not inquisitive. His is an argument, not an investigation. “There can be no doubt”, Dibb reports, “that Putin’s Russia is now seeking to reassert itself as a major power. The outward symbols of this occurred as long ago as 2008, when Russia used military force against Georgia, although not very impressively. “ Dibb omits to discuss the preliminaries to the August 2008 fighting, or identify ex-President Mikheil Saakashvili who moved first. On the Syrian front, according to Dibb, “Russia’s use of military force in Syria is a clear demonstration of Putin’s aggressive conduct of foreign policy” – no mention of US, Israeli, Turkish, Saudi, and NATO attempts to remove President Bashar al-Assad. 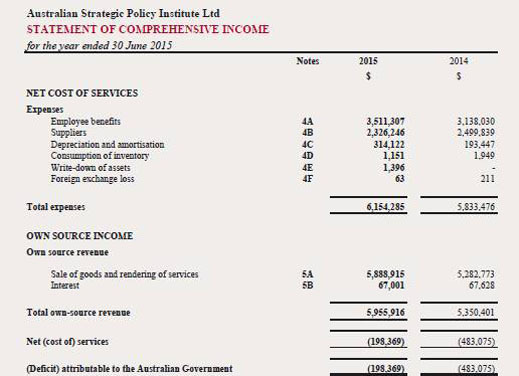 The ASPI balance-sheets show it has been in the red since 2012. Either the think-tank must cut its losses, meaning smaller stipends for Russia experts like Dibb. Or else it must appeal for bigger donations from foreign governments and weapons suppliers. The Dibb report makes clear which option he favours, but since he isn’t sure warfighting against Russia should become too public, he muffles his message. Another rhetorical question, to which Dibb gives a camouflaged yes.